A must have iDevice accessory! Free up all that space on your idevice for those 1.2million + apps and store all of your photos, videos, and music on this amazing MFI certified Lightening and usb drive. I have used Hyper Shops products in the past and their quality is impeccable. I was a backer of Mblock a similar product( full streaming of video and audio with photo backup) however the creators of that project couldn't convince me of their ability to deliver the product(read my full post and update here). I can't wait to get my iStick and free up the space on my iDevices. They are in their last 62HRS help they reach all of their stretch goals and get the iStick before its released to the public. Want to get more than one iStick? HYPER by Sanho Corporation has been making storage products since 2002 and iDevice accessories since 2009. We have been awarded the prestigious CES Design & Engineering Honors by the Consumer Electronic Association not once but twice, both for storage products. This is our 2nd Kickstarter project. Our first Kickstarter project,CloudFTP, also a storage product, was the 3rd highest funded Kickstarter technology project when funding ended and named by Stuff Magazine as one of the “10 best Kickstarter technology projects”. 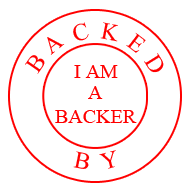 We are also the technology provider for another successful Kickstarter project called CameraMator.